FilePDP04309 - Green Cover Sketch Book. File PDP04309 - Green Cover Sketch Book. File consists of one hardcover sketchbook containing 65 artworks (primarily graphite sketches and one painting) by Max Singleton Maynard. The sketches have been described at the item level and each sketch has been assigned a unique PDP number. In addition to these, there are also sketches on the inside of the front and back covers. The sketch on the inside of the front cover is attached at the file description for the sketchbook. 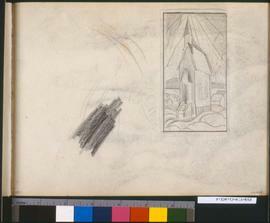 A page has been ripped out between PDP04317 and PDP04318; this page contains partial sketches on the recto and verso. A page has been ripped out between PDP04365 and PDP 04366 but contains no sketches. 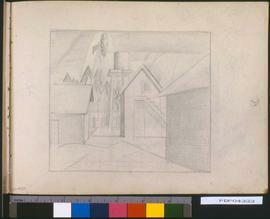 Individual sketches have been digitized. See item level descriptions. The sketchbook is held not available for access without an appointment. Please consult the digitized images. Sketchbook contains the following PDPs: PDP04310; PDP04311; PDP04312; PDP04313; PDP04314; PDP04315; PDP04316; PDP04317; PDP04318; PDP04319; PDP04320; PDP04321; PDP04322; PDP04323; PDP04324; PDP04325; PDP04326; PDP04327; PDP04328; PDP04329; PDP04330; PDP04331; PDP04332; PDP04333; PDP04334; PDP04335; PDP04336; PDP04337; PDP04338; PDP04339; PDP04340; PDP04341; PDP04342; PDP04343; PDP04344; PDP04345; PDP04346; PDP04347; PDP04348; PDP04349; PDP04350; PDP04351; PDP04352; PDP04353; PDP04354; PDP04355; PDP04356; PDP04357; PDP04358; PDP04359; PDP04360; PDP04361; PDP04362; PDP04363; PDP04364; PDP04365; PDP04366; PDP04367; PDP04368; PDP04369; PDP04370; PDP04371; PDP04372; PDP04373; and PDP04374.